Yay! I love Friday the 13ths! My birthday is July 13th so 13 is my lucky number! My birthday ends up on a Friday every so many years too and I always love it when that happens! Hopefully my lucky number will bring me luck in this giveaway! Thanks for these great giveaways! I now look forward to them every Friday! They look great! I'd love to have them. So glad Bob Hostetler liked this on FB or I would have never found this interesting blog. Must check out more thoroughly when I have time, but do enter me into the lucky 13 contest. I love this set. Thank you for offering it! sign me up for your giveaway! Thanks. Consider me signed up. Keep up the good work. What a beautiful collection! I pray the winner truly appreciates the value of this prize and is not just in it for a win ! Pick me please!!! I LOVE books!! There are books on that shelf I don't have and haven't read-- 'nuff said! What a lovely idea. reminds me of my grandmother's book shelves. What a beautiful collection! 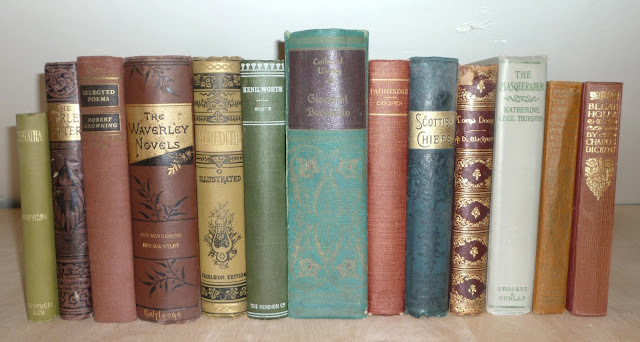 I so love the feel of an old book in my hands, and especially ones as beautifully bound as these! I can already smell that wonderful, old book smell. I'm visualizing winning these! Would take such good care of these! I love old books - both to read and to display. Someone is going to open a box that feels like Christmas! Thanks for having the giveaway. Looks like a nice assortment. Brilliant titles, enter me please. What a lovely set! Yes, please, include me. I have just the spot for these! Beautiful binding and intriguing titles. Please if Your Friday give away is still open, I'm in. Thank you!